An item high on my to-do list has been preparing for a major training, which is coming up in the next few weeks. I’ll be working with 160 leaders from an organization that I train semi-annually. As I work on this, I’ve been examining some of the critical aspects of training: the techniques and methods that help capture the interest of audiences and reinforce learning. For trainers, engaging audiences—particularly adults—is one of the most difficult challenges we face. How can presenters ensure that they’re hitting the mark? Here are some effective presentation skills and tricks of the presentation trade that I’ve learned throughout my career. This is my first commandment of effective presentations. If I tell an audience that the “show” begins at 9:00, it’s crucial that it actually begins at 9:00. There is no room for my being late or unprepared to start. The penalty is that those who did arrive on time are penalized. I have been in situations where perhaps a room is not yet full or a storm has caused traffic delays. Too often in their conversations, I have heard presenters say, “Let’s wait five more minutes (and then maybe five more) for people to show up.” This shows colossal disrespect for those who arrived on time. Starting times should be non-negotiable. Latecomers can always catch up. A common trap into which many presenters fall is to put all of their work and ideas onto slides, and then simply read them. They could save everyone’s time by just emailing PDF copies! This method creates other problems, such as a tendency for viewers to focus on the screen and not the presenter. This decreases engagement and increases the odds that attendees will start browsing on their smartphones. Another issue of greater import is that it’s insulting to the people in the room because they came to access new information and ideas, not see a presenter’s back as he/she reads from a screen. My approach is to use PowerPoint strategically. Instead of reading slides like a teleprompter, I prefer to put a word or two on a slide, which reinforces the main ideas, or to use an image, graphic, or photo, which increases interest and helps drive the point home. When a presenter knows the material, there is great value in using subtle reminders to guide the presentation. This keeps the audience focused on you. Avoid filling slides with so much detail that it shifts the focus away from you, the presenter. Energy, volume, tone, and cadence—all of these elements are critical when engaging an audience. Occasionally, I make a point by increasing my volume and other times by decreasing it. Sometimes, a change in speed or tone can tweak the antennae of your audience members. Adopting a monotonous “Charlie Brown Teacher” style will drag down your training, losing your people is also a real pain. Varying your voice, speed, and delivery helps keep your audience’s brains continually refocused and alert. The average attention span is about five minutes; my presentation is four and one-half hours! Do you think I need to find ways to reengage and recapture attention continually? You bet I do! This is where your toolbox of effective presentation skills comes in handy. In addition to changing speech patterns, I can move around the room and engage the audience. Often, I go into the audience and do some role-playing with participants. This shakes things up, allows other voices to be heard, and makes the learning more interesting. 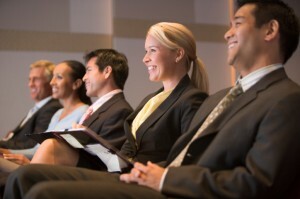 Instead of sitting passively, audience members can become active members in breakout groups. The size of the groups tends to be somewhat plastic and, while they differ, they can be assembled in a variety of ways—from participant interests to functions they perform in their work. In breakout sessions, people have the chance to physically move to new locations within the room, interact with a different group of people, and experience other viewpoints. Depending on learning styles, it can be tremendously difficult to sit and listen to someone—no matter how fascinating they are—and retain much of anything. For most people, it helps to have something tangible on which to work. I often include worksheets or handouts, or engage participants to act as scribes and help work on flip-charts. It gives them something to grasp or refer to after the event as well as prevent monotony. If an entire presentation is devoted to lecture and PowerPoint screens, people will disengage. Who could blame them? A technique I’ve found useful is getting people involved in some sort of game that demonstrates leadership. In one, for instance, I assemble groups of six to eight people with a goal to take a six-foot rod from above their heads and lower it to the ground together without dropping it. It’s a great demonstration of the impact of teamwork because everyone has to function in a fluid environment, and adjust and move to their cohort and maintain the same speed. The fact is that folks often come into these types of training sessions with their own definitions of leadership. Uncovering these belief systems and taking steps to open them to new opportunities are critical parts of the program. Why not use games to underscore their learning? A challenge for presenters is to contend with smartphones, short attention spans, and audience members who have different learning and personality styles. These effective presentation skills and techniques will help you become an expert presenter for the next time you want to engage and reengage with your participants. These ideas will ensure that they leave the training with more knowledge, fresh ideas, and more motivation than they had when they walked in.